An easy bread recipe that's perfect for beginners, this basic white bread recipe will make two delicious loaves. Once you discover just how easy it is to make fresh, homebaked bread, it will quickly become a staple at your dinner table and it makes a great sandwich bread. This recipe uses all the basic bread ingredients: flour, milk, water, yeast, sugar, and salt. It takes just about 20 minutes to prepare the dough, then an hour wait to allow the dough to rise. After a final kneading and shaping of your loaves, a second rise takes place before it's baked. Your finished bread can be served fresh out of the oven or frozen for later use. Because it is such a basic recipe, you can also experiment with it by adding a cup of raisins, nuts or other flavorings. 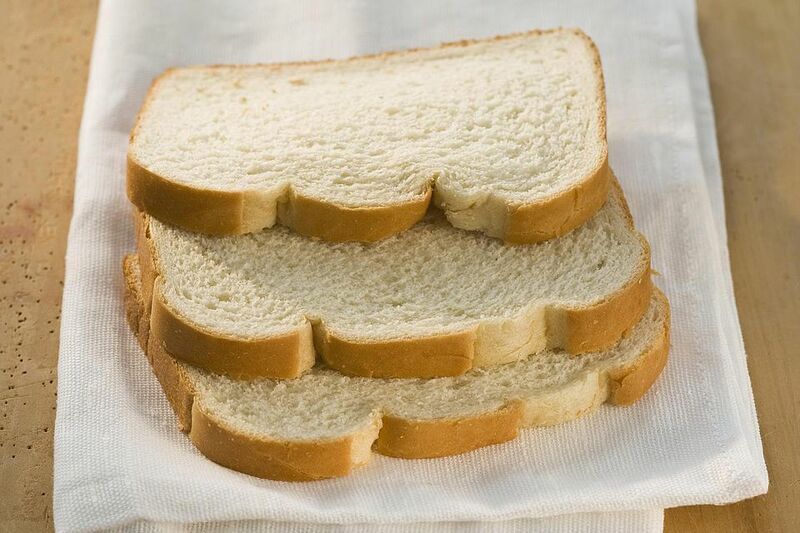 Note: while there are multiple steps to this recipe, this basic white bread is broken down into workable categories to help you better plan for preparation and baking. Heat 1 cup of milk and 2 tablespoons of butter in a small saucepan over medium heat. Remove from the heat when the butter is melted and set aside to cool. Pour 1/2 cup of warm water into a small bowl. Slowly pour the yeast into the bowl while stirring. The constant stirring while adding the yeast will prevent it from clumping. Set the bowl of yeast water aside for about 5 minutes while you work on the next two steps. In a large bowl, add the sugar, salt, and the remaining 1 cup of warm water. Mix well. Check the saucepan of milk and butter. If the contents are warm to the touch, pour the liquid into the large bowl and mix. Begin mixing in the unbleached bread flour, one cup at a time. By the fifth cup of flour, the dough will begin to get stiff and it will be difficult to mix it with a wooden spoon. Turn the dough out onto a lightly floured board and begin to knead the dough. Continue adding more flour - a couple tablespoons at a time - and knead the flour into the dough until the dough is smooth and no longer sticky. How much flour you use will depend on many factors, including the temperature, humidity and altitude of your home. It's likely that you will not use all 6 or 7 cups. Grease a large bowl with butter, shortening or oil (the bowl should be 2 to 3 times the size of your dough). Place the bread dough into the bowl and then turn the dough over so that the top of the dough is also greased. Cover the bowl with a clean kitchen towel and let the dough rise at room temperature until it has doubled in size - about 1 hour. Turn it out onto a floured board and knead out all the bubbles for about 5 minutes. Divide the dough in half and form each half into a loaf by rolling the dough into a rectangle. Roll the dough up like a jellyroll. Pinch the seam closed, then pinch and tuck the edges under the loaf. Grease two loaf pans. Spread a light layer of yellow cornmeal on the loaf pans, if desired. Set the loaves in the pans. Cover with a kitchen towel and allow the dough to rise until it has doubled in size (about 30 minutes). Bake the bread for about 45 minutes or until the crust is golden brown. Remove the bread from the oven and turn out the loaves onto a rack or a clean kitchen towel. Allow the bread to cool before cutting.